Most international airplanes are equipped with bassinets, located in the bulkhead areas of the plane. While the bassinets can fit only children under 25 pounds, in reserving the bulkhead-bassinet seating for you, airlines never ask if your baby is a descendant of the Hulk or whether you actually plan to use the bassinet. As such, as long as your child is under 2, and not too many other parents have checked in before you, you will get the roomy bulkhead for free. As these seats are reserved for travelers with small children and (at least in our experience) there are not many small children on international long-haul flights, you will most likely get the entire row to yourself. International airlines welcome families with small children in the preferred ticket lines, even if there are no signs indicating as such. So instead of taking your place in a winding line of other miserable travelers, immediately upon arriving at the airport ask an airline agent if your family can check in at the preferred line. They will most likely say yes and may even then show you to the preferred baggage-check and customs lines, as well. Even with expedited service, everything takes longer with a baby. Give yourself plenty of time at the airport to fix any ticketing problems you may have, ensuring you don't have to leave baby behind. 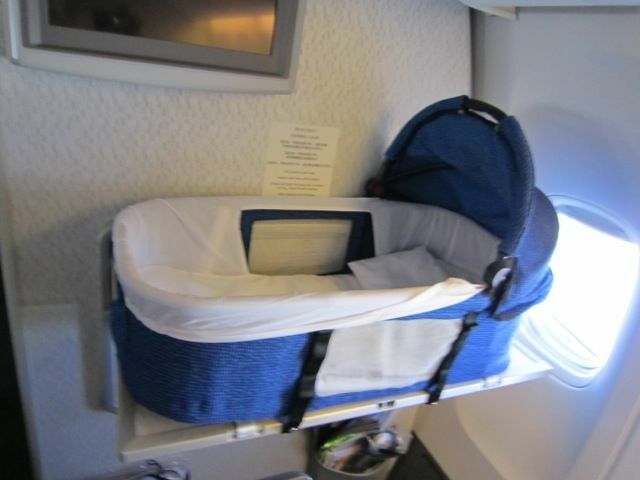 Earlier arrival also makes it more likely you will be able to claim the bulkhead bassinet seating, which is awarded on a first-baby-come, first-baby-served basis. E-tickets work fine when you’re traveling alone. But when you are traveling with a baby on your lap, always bring a printed-out copy of your ticket to avoid confusion at the airport. Viewing the printed ticket before arriving at the airport also gives you the chance to make sure that all of the information on the ticket is correct, information that may be too late to change once at the airport. (A note from personal experience -- pay particular attention to how your little one's name appears on the ticket, making sure that it is identical to the name as it appears on her passport). In the United States, you can bring your child to the gate in her stroller and then have the stroller delivered back to you as you disembark the plane. Abroad, you can also check the stroller at the gate but the stroller is then checked and returned to you on the baggage carousel with the rest of your bags. So if you don’t have a carrier with you, upon landing in your new international destination you will have to manage an unrestrained, groggy toddler through an international airport, customs, and baggage claim. So unless your stroller is small enough to actually put in the overhead compartment, always bring your carrier on board to help when you arrive at your destination.